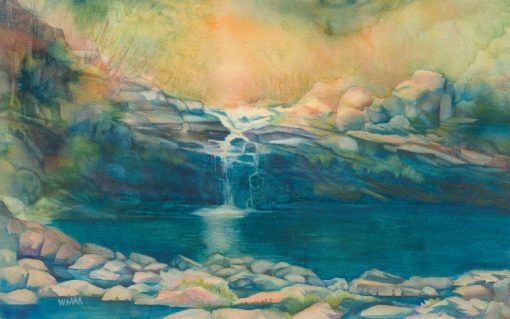 19″ x 12″ watercolor painting available as original fine art, giclee print, and greeting card. Living in a rain forest, I am surrounded by waterfalls. This particular falls is a bit off the beaten path and not all that well known. It’s a nice place to swim on a hot summer day. Only three colors were used to paint this entire painting.